Last Thursday, California's attorney general, Kamala Harris, sued Corinthian Colleges, one of the country's biggest -- and worst -- for-profit college companies, for "false and predatory advertising, intentional misrepresentations to students, securities fraud and unlawful use of military seals in advertisements." 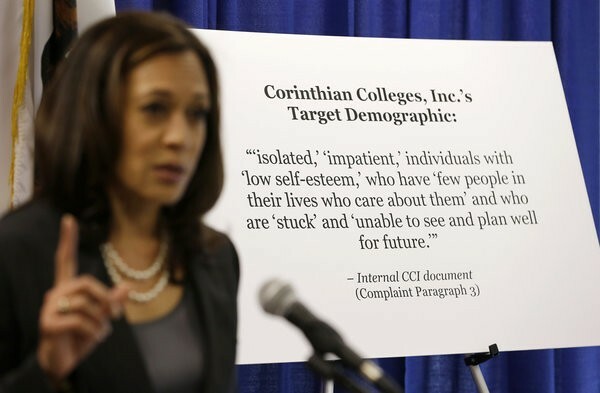 Harris's lawsuit claims that Corinthian, which operates the schools Heald, Everest, and Wyotech, deceived prospective students, investors, and accrediting agencies about its graduates' job placement rates and other critical information. Five years ago, the company paid $6.6 million to settle similar claims by the California AG, but the bad behavior allegedly did not stop. Corinthian, which gets about 90 percent of its revenue from taxpayer money, is the subject of numerous student and staff complaints, and is under investigation by at least five other state attorneys general (FL, IL, KY, NY, OR), the federal Consumer Financial Protection Bureau, and the Securities and Exchange Commission. Two-thirds of Corinthian's associate degree students drop out; three-quarters of former students can't pay down their loans, and 36 percent default within three years, the highest rate of all publicly-traded college businesses. The California AG's complaint cites numerous internal Corinthian documents that portray a company spending lots of time putting lipstick on an enormous pig -- Corinthian executives knew its programs were falling short of student needs and required standards, but it failed to share that information with the public. Corinthian's recruiters and its ubiqitous ads on "Jerry Springer" pushed its programs, according to company documents, to "isolated," "impatient" single parents with "low self-esteem" who are "stuck" and "unable to see and plan well for the future." Corinthian executives knew that student "[e]nrollment largely hinges on selling affordability & [job] placement." Selling affordability required smoke and mirrors, because the school charged sky-high prices, like $43,010 for an associates degree in medical assisting. We have done a pretty remarkable job in terms of placement.... We're very tight on our definitions. And so if you're a medical assistant, for example, with us and you get a job at a doctor's or the hospital, those count. If you get a job as an aide at a nursing home, that does not count even though you're making $10 to $12 an hour. But the facts told a very different story. Internally, Massimino was telling his staff, "We have a placement compliance problem now." Corinthian management repeatedly admitted in inter-office memos that the company had no consistent definition for what constituted a placement. Corinthian fudged the numbers using such tricks as counting as permanently placed students who were hired by a Corinthian partner to work two days at a health fair, or hired by temp agencies paid for the purpose by Corinthian. Many placements were counted twice. Audits of various campuses revealed that student placement files had simply disappeared; others were backdated. Where campuses were performing poorly, Corinthian deemed them closed and excluded their placement rates from the already-rigged company-wide figures. The California AG alleges that top Corinthian executives knew their public claims about placement rates were false. Harris's lawsuit also asserts that some Corinthian campuses in California advertised programs, such as ultrasound and radiology technician, that they didn't even offer. When students visited the schools to enroll, Corinthian staff pressured them to sign up for other programs. Corinthian ads also displayed logos of branches of the U.S. armed forces in a way that implied an official connection to the military. In addition, Corinthian required enrolling students to sign a waiver committing them not to sue the company for anything at all, including fraud and intentional injuries -- an agreement illegal under the law of California and other states. Marc Morial. Morial is President and CEO of the National Urban League, a former mayor of New Orleans, and an inspiring national spokesperson on important policy issues. On April 30, Corinthian announced that Morial had joined its board of directors, along with former Obama Secretary of Defense Leon Panetta. But Panetta quit the board on July 16, praising Corinthian but declaring that he now realized his busy schedule did not leave him time to serve on a board he had joined eleven weeks earlier. (On April 30, I had published an article, and on May 31 The Los Angeles Times ran a piece, each criticizing Panetta and Morial for joining Corinthian.) But Morial has stayed on the Corinthian board, even though his Urban League's mission is "to provide economic empowerment, educational opportunities and the guarantee of civil rights for the underserved in America," and Corinthian's record shows that it accomplishes just the opposite -- it takes students' money and often leaves them deep in debt without giving them real training for a better career. So why is Morial still on Corinthian's board? I don't know. Last year, Morial's Urban League accepted $1 million in aid from Corinthian. Corinthian board members also generally receive $60,000 per year in cash plus $90,000 in deferred stock; in June Morial received 20,822 shares of the company, now worth about $41,000, which will fully vest next month. That would be a huge sum for one of the thousands of former Corinthian students who are deep in debt, but is it enough for Morial to outweigh the reputational burdens of associating with such a troubled institution? At the next Urban League board meeting, can Morial explain his involvement with Corinthian to Urban League board members like former U.S. cabinet secretaries Alexis Herman and Rodney Slater? Can he explain it if he encounters Attorney General Harris on the set of "Morning Joe" or at a civil rights conference? Pension Funds. Pension funds, of course, are working to maximize investments for their retirees. But do teachers and other enlightened, public-spirited members of leading national pension funds want them to invest in companies whose business models turn on enticing vulnerable populations into insurmountable debt and lying to investors and regulators? Corinthian stock is now trading at slightly under $2 per share, down from $20 a few years ago. Has the ride been worth it for Corinthian owners CALPERS (California state retirement fund, 1,030,000 shares), TIAA-CREF (fund for academic, research, medical and cultural workers, 389,000 shares), the New York State Teachers Retirement Fund (179,000 shares), California State Teachers Retirement System, the Florida Retirement System, the Teachers Retirement System of Texas, and the Arizona State Retirement System? UPDATE 02-22-16: Looking back, I failed to mention that the Washington Post Company, now Graham Holdings, was long a part owner of Corinthian, with an ownership share that it reduced from 8 percent down to around 5 percent as the company headed toward collapse.